ESL Music is delighted to announce our newest signing, Natalia Clavier. Federico Aubele fans will already be familiar with Natalia's achingly beautiful voice, which features prominently on his latest record Panamericana. Her debut album "Nectar" marks the first ever release by a solo female artist in ESL's history, and was recorded at D.C's Consulate studios last year between her hectic touring schedule; singing live with Thievery Corporation and Federico Aubele. 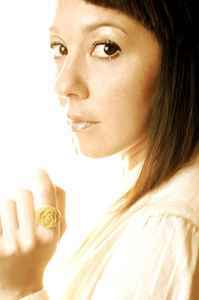 Those of you unfamiliar with Natalia can connect with her and preview tracks from the album at her myspace page. Natalia recently joined Federico Aubele on his spring US/Canada acoustic tour, supporting British Act Morcheeba. Check out Brightest Young Things for a review of the D.C show.